The winner of ESA's 'Graffiti without Gravity' street art competition has left a permanent mark on the Agency's technical heart, with this mural on the wall next to ESA's Compact Antenna Test Range. Irish street artist Shane Sutton won the Graffiti without Gravity competition in May. 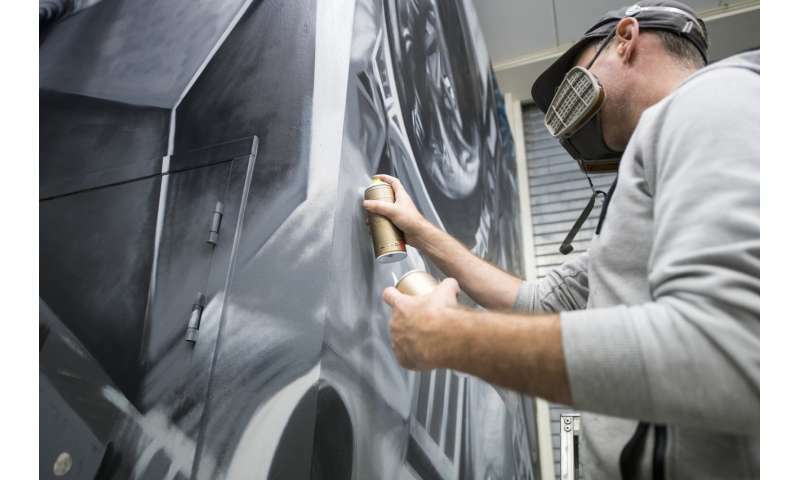 Jointly organised by ESA and the Hague Street Art, 10 top street artists from across Europe competed together against the clock to create artworks across 2x2 m canvases. Then, as a result, ESA's antenna testing team invited Shane to decorate the entrance to their Compact Antenna Test Range (CATR), used to test satellite antennas in space-like conditions. "This gave me more than six times bigger than the competition canvas to work with," says Shane. "And the wall incorporates a corner, so I included related images on each side. It's fun to paint such a large work – for me it's all about giving things a go." It took Shane two and a half days to finish – and you can watch the entire process here in this time-lapse video. The mural shows an astronaut in contact with ESA's Rosetta mission like someone holding a puppet on string, representing the use of antennas – essential to link space missions with their home world. Its background shows the 'anechoic' foam spikes that line the walls of the CATR, serving to absorb radio signals and reproduce the boundless void of space. "I've been interested in space as a subject anyway, well before Graffiti without Gravity," explains Shane. "My first big artwork was inspired by a trip to Munich Airport, where I saw a sculpture of an astronaut hanging out of the roof. "For what I call my 'Spacer' paintings I like to use the narrative of 'that space in between' – which I describe as the place after you leave but before you get there. It's somewhere we all go at some point and I like to represent this through faceless astronaut paintings. "Things have taken off as my work was retweeted by various people, including astronaut Chris Hadfield, and I've been commissioned for artworks by various companies. "The idea for the artwork gets sketched out first, then I scale it up for the space using a grid, adding different colours to the various blocks as I go, with pure white coming last." "We commissioned Shane after seeing the competition," comments ESA antenna engineer Luis Rolo. "Our idea was to make an artistic connection with the hi-tech activities we carry out." "We do a lot of exciting work here in the facility with a lot of different people, from ESA projects as well as outside customers," adds ESA antenna engineer Eric van der Houwen. "This new artwork gives us a more stimulating environment that reflects that excitement, ripe for innovation and discovery." The CATR is one of several ESA antenna test facilities, including its 'big brother' HERTZ chamber used for full-size satellite testing in cleanroom conditions.